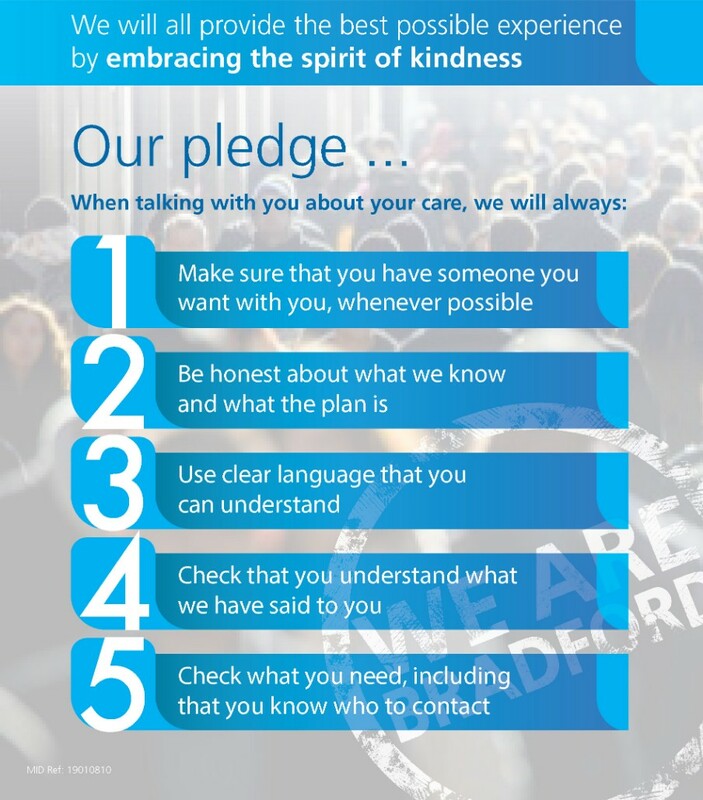 Bradford Teaching Hospitals is committed to ensuring that patients have a positive experience of the care they receive. We are dedicated to listening to all patients and service users to ensure that we provide better, safer care. We welcome patient feedback ranging from compliments and comments, to concerns and complaints. We appreciate at times things don’t always go quite as expected and we would encourage you to raise your concerns to a member of staff in the first instance. In many cases it should be possible to remedy an issue immediately talking to the person you have already been dealing with, or perhaps their manager. If you are not happy with the care and support you have received on a ward or within a department, we would urge you to contact the Trust’s Patient Experience Department (formerly PALS and Complaints). We are currently running a survey to gather views on the end-of-life care we provide at Bradford Teaching Hospitals. If you are the family member or friend of a patient who recently spend their last days or hours in one of our hospitals, we would be very grateful if you could complete our survey, which only takes a few minutes to complete. The feedback we receive will be used to ensure we provide the best possible care to end-of-life patients. You can also find the results of the surveys we have received so far here. How can the Patient Experience Department help you? We will advise and support you if you wish to make a formal complaint and identify independent advocacy and support. In person: by making an appointment on 01274 364810. The above film highlights the importance of effective communication with patients and staff at Bradford Teaching Hospitals. Kindness and compassion are already fundamental to the service we provide, and effective communication is one way that we can show kindness in our work. The film aims to help our staff reflect on their practice and consider where we can enhance this – often through small changes to our practice. Anyone who has been seriously ill knows that kindness and empathy make it possible to cope with difficult times, and can even help recovery. Patients who have received treatment for cancer in our Trust and their relatives told us why experiencing good communication matters. Through focus groups they identified the following five key communication standards we will always try to uphold. Thank you to the patients involved in the film and all those who have helped develop these standards for effective communication. If you have ideas about how we can improve the communication skills of our workforce, or have identified barriers that we need to overcome to enable better communication, please contact the Patient Experience team.